4. Why do you row? I rarely do. But I cox because it’s rewarding. I think that there is no feeling like seeing the people you’ve trained and competed with unlock their potential throughout the years. It’s a slow progress, but the delayed satisfaction makes it worth it. 7. What your favorite Davis hangout? It’s not really a place to hangout, but if you drive past West Village onto the country roads at night you can get away from all the light pollution and see the stars. I’m from LA, so I never get to see things like this back home. 10. What is your greatest rowing achievement? There’s not really one specific achievement that can highlight my time on the team. But I can say that it’s so rewarding knowing that your teammates trust and rely on you. It’s a nice feeling when you know all the effort and hours you put into the team is rewarded by your teammates’ trust. So I guess really, my greatest rowing achievement is being able to end my last year with the knowledge that I’ve proven myself to be an asset to the team. 11. What is your greatest achievement outside of rowing? Also, not really a specific achievement, but it’s hard to note your progress as an individual when you’re yourself every day. After joining rowing, I’ve noticed I’ve been a lot more interactive and social with people I don’t know. Coming from a really “shy kid” background, I mostly didn’t talk to people outside of my small friend group before entering university. But, joining the team really helped me form a solid base network at school and through my experiences both on the team and in university, I’ve met so many people that I can see myself continuing friendships for years after. 12. Why/how did you join rowing? Before I entered Davis, I saw a recruitment post on my freshman class page of the ACRA 4+ that won nationals. 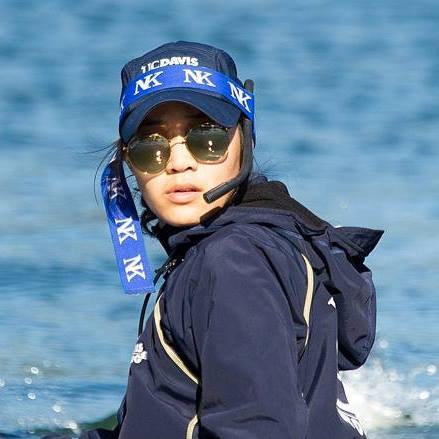 I remember seeing a female coxswain and it piqued my interest. I sought them out during the involvement fair and have been here since. 13. What differentiates UC Davis rowing from other clubs in your eyes? Truthfully, I’m not sure if the Davis rowing club is different from other clubs. Obviously, there is a charm to the team considering I’ve stayed for so long. I guess I fell in love with the people I have the pleasure of being teammates with. 14. How has rowing affected you? (Oh man). Rowing is a tough sport. I’m just a coxswain, but after growing/living/befriending with the rowers for so long you eventually grow to appreciate and empathize with the pain they go through both mentally and physically. I used to play badminton in high school with a team as well, but the sense of camaraderie was never there. Being on Davis’ rowing team made me realize how important it was to put the team before yourself. Selfishness has no place in this sport. 15. Of all the races you have rowed, which was the most significant to you and why? I think I have to dig deep back for this one. It was our first duel as novices against UCSD, a varsity program. Our novice coach Luis said the novice squad hadn’t beaten them in many years during our boat talk before going out on the water. And, well, we won. I guess that was the moment when I realized that I wanted to stick to the program throughout my undergraduate career. 16. What is one distinct memory you have from a practice or race during your time on the team? It’s hard to pull up memories, but my favorite practices have always been when I’m given feedback afterwards. When I first started out, there was a huge disconnect between the coxswains and the rowers and it didn’t feel like we were one as a boat. Coming into my fourth year now, it’s nice to get constructive criticism or compliments at the end of a practice because it feels like I can act a representative for my boat and that I’m contributing to their overall progress. 17. What is one way you have contributed to the team? I’ve been coordinating race itineraries and traveling all my years on the team. It was kind of scary in the beginning—my first trip to plan was nationals during my novice year. Still don’t know how I managed to pull it off. But after that, I realized I really liked planning and organizing out traveling events. Sometimes it’s stressful getting through the logistics and handling the inevitable miscommunication we’ll have with a large team, but I don’t regret becoming the Secretary and Travel Coordinator for the team. I’ve learned so much about how this club works while on the Council and hope that the resources I have collected so far will help the team in the future. Power Ten Profiles are quick profiles of current and alumni rowers. If you have a suggestion of someone we should profile, or a story idea, please contact Mark Palmerston ‘99-’02 at [email protected].